Will we be ready for autonomous vehicles by 2021? Check out this post to see what experts have to say about the future of autonomous vehicles. It's been a mixed year for the advancement of autonomous driving. In March, a test Uber hit and killed a jaywalker. Each car has a safety driver behind the wheel, but the dashboard cam revealed that they were watching reality TV on their phone and, without the ready reflexes to take over the wheel, the fatal crash prompted Uber to halt its autonomous vehicle operations in Tempe, as well as in Pittsburgh, San Francisco, and Toronto. Surveys of the public prove that getting people to ride in autonomous cars will hold some resistance — in an April AAA survey of over 1000 US residents, 63 percent reported that they would feel less safe sharing the road with a self-driving vehicle than while walking or riding a bicycle. But, those invested are getting ready for their arrival. In March of this year, Waymo announced that they’d purchased 20,000 sporty, electric self-driving vehicles from Jaguar for the company’s forthcoming ride-hailing service. They estimate that the Jaguar fleet alone will be capable of doing a million trips each day in 2020. These are numbers that, if accurate, will change US driving as we know it and substantially disrupt not only ride-sharing but the practice of humans driving cars. There's been a range of predictions as to when we'll see driverless cars ready to take the highways and city streets. While ride-hailing services are predicting March 14, 2020, BDO recently carried out an analysis of the predictions and found that driverless cars will arrive in early 2021. This date comes from researching car companies, auto industry suppliers, ride-hailing services, and other experts. Much of the automobile industry subscribes to the SAE International standard, which splits driverless into five categories. Most car companies seem to be aiming for level 4. This is defined as ‘High Automation’ and means that a driverless car can take appropriate action in many different driving situations — i.e. drive itself under many different circumstances, such as when a human driver is unable. Additionally, BDO notes that others eschew mentioning specific levels, instead, preferring to talk about driverless technology capable of either highway or city street driving. 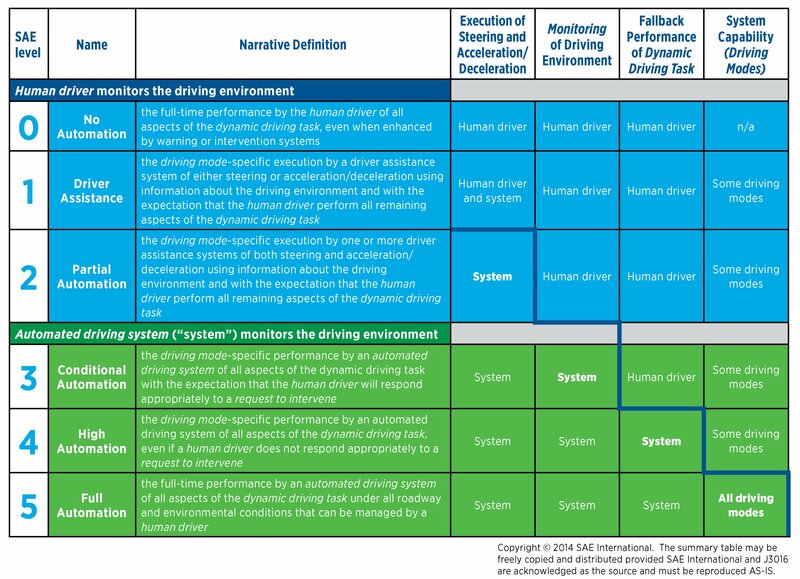 In essence, leaning closer to level 5, where a car is fully autonomous, can function without human attention or intervention in all driving modes. While driverless technology may be ready to roar out of the starting blocks, rules and regulations are still lagging somewhat behind and offer no indication on when they will be able to catch up with technology — nor do they look like they will necessarily be ready any time soon. What will you be paying to use driverless vehicles? How can/will companies subscribe on behalf of their employees? Taxation — This becomes an issue due to a change in ownership model and, indirectly, through things like decreased revenues from the sale of gasoline and diesel since most driverless cars are electrics or hybrids. Who will maintain this infrastructure to allow driverless cars to function as optimally as they should? Some of these issues become compounded by how different to ‘regular vehicles’ the new breed of driverless cars will be. For example, the life-span of a driverless vehicle may be as low as a year. They also raise issues regarding data security and sharing. Much of the data relating to your transport in a driverless car could be classified as personal data, putting it under the jurisdiction of data protection laws. Who can gain access to it — and when — and whether it can be monetized is something that is, as of yet, not clearly determined. Unsurprisingly, lawmakers are not necessarily moving at a brisk pace. Futuristic Vivak Wadhal predicts that "by 2025, it should be that we can build self-driving electric cars for about 15k that go about 100 miles." The electric self-driving vehicle will become a necessity, as China and India ban combustion engines. "We are happy and proud to offer you this service, but be very aware that it – and its cost – are more than likely to be subject to rapid changes in regulation over the coming 10-15 years." The vehicle technological capabilities are here already. But, the laws, road rules, and regulations (and the reluctance of many to travel in an autonomous car) means that we'll be waiting with impatience for the structures and society to catch up. Do People Trust Autonomous Vehicles?